Tamimi was arrested early on 19 December following a confrontation with two Israeli soldiers a few days earlier at her family home in Nabi Saleh near Ramallah. The 16-year old, along with her cousin, was telling the soldiers to leave her house before things eventually escalated to the use of physical force, when one of the soldiers slapped her. The situation escalated and led to the shooting of Ahed’s 14-year-old cousin, Mohammed, in the face. The entire incident was filmed and the footage has since been viewed and shared globally with both solidarity and admiration over these young girls’ uncompromising stand, as well as outrage from Zionists who have demanded punishment ranging from imprisonment to crude violations of human rights. 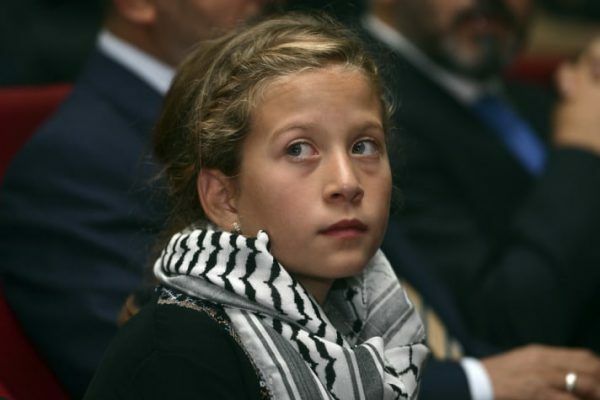 Ahed Tamimi is facing 12 charges made by the Israeli authorities, including incitement, making threats, assault, and stone-throwing which relate to six different incidents. To make matters worse, more of the family members have since been arrested including her 43-year old mother Narimen Tamimi who faces five charges, as well as her 21-year-old cousin, Nour Naji Tamimi. During a protest demanding their release from Ofer prison, Ahed Tamimi’s cousin Manal Tamimi was also arrested. The targeting of this family is, in many ways, unsurprising. Indeed, the family is known for its long standing opposition and resistance to the Israeli occupation, as well as its regular participation in various protests in the West Bank, often captured through images and video streaming. The article that accompanied this cover reflected on the release of Bassem Tamimi – Ahed’s father – from an Israeli prison where he was held for 13 months because of the weekly protests he organised against the Israeli Occupation, and the international solidarity campaign that was organised in response. Never has the expression “it takes a village” been truer than the example of Nabi Saleh. The bravery and sacrifices of the locals in their opposition to the continued violation of their rights by the Israeli government, have been an inspiration to those resisting imperialism around the world. When you become an empowering example to the oppressed, it is only natural that your oppressor wants to also make an example of your defeat. When it comes to the story of Ahed and her family, the Israeli state is clearly completely oblivious to the counter-productive effects their actions are having, as popular support for the Tamimis mounts. Many personalities, not known for having a particularly pro-Palestinian stance have been left shocked and angered by the Tamimis’ treatment. In the UK, even the high-profile ex-footballer Gary Lineker took to social media in outrage over their actions. Or perhaps Israel is so incredibly arrogant in its crusade to destroy Palestinian resistance, that it is unbothered by the growing outrage. Based on Israel’s continued treatment of Palestinians, this seems more likely. It was also reported by the director of the Commission for Detainees and Ex-Detainees Affairs, that there are 400 Palestinian children currently held in Israeli prisons, including in Ofer prison. Over 90 percent of these children have been forced to endure some form of brutality in custody, with torture becoming a systematic practice. UNICEF highlighted the “widespread” and “institutionalised” nature of violence towards children in Israeli military detention back in 2013. Since then, little seems to have changed. The dehumanisation of Palestinians is still very much alive and kicking. Just recently, Michael Oren, former Israeli ambassador to the US called for a more fatal approach by Israeli forces, and Israeli Education Minister Naftali Bennett has suggested life imprisonment for her. With between 500-700 Palestinian children either arrested, detained or prosecuted, it is clear that the story of Ahed Tamimi is not the first of its kind, nor will it be the last. Rather, it symbolises an ongoing, structural and systematic approach of Israel’s treatment of Palestinians. It is therefore crucial that international pressure grows, both to free the Tamimis, as well as the thousands of Palestinian political prisoners in Israeli jails. The attempts to demonise this young girl are obvious for all to see; from the convenient omission of the fact that she was attacked first in most media reports, to the failure to inform people that under international law the oppressed have a right to self-defence. She is already – implicitly or explicitly – judged guilty by many. This is the treatment reserved to Palestinians of all walks of life whenever they have the gall to resist their oppressors. Whether they are resisting military massacres, calling for international boycotts, or marking Israel’s ethnic cleansing, Palestinians are described in much of the mainstream media as always guilty, always provoking, always dangerous. This treatment however, is limited neither to the Tamimis nor to the Palestinians. It is inherent to the western approach to settler colonialism. In this sense, Israel is not an exception but in fact confirms the rule. Our solidarity must go beyond sympathising with Ahed Tamimi, to fighting the very white supremacist capitalist system that sustains the continued colonisation of Palestine and the dehumanisation of Palestinians. Accountability is something all of U.S. are able to exercise sitting at home on our sofas, by signing petitions, tweeting at local MPs to organising mass emails to Theresa May. Joining local solidarity groups and implementing BDS policies in our colleges, universities, workplaces and communities is another logical step. We must also make it clear to the largest funder of Israel – the U.S. – that their complicity will be fought, resisted and defeated.